The Milky Way’s Fossil Record: Where did our Star-Stuff Come From? As Carl Sagan famously put it, “We are made of star-stuff”. All the elements in our bodies heavier than lithium were fused by stars that died, enriching the material that the Earth and Sun were born from. But what is less well-known is that not all of these elements came from the same places, or were produced at the same time. Some elements (like carbon and oxygen) can be fused in the interiors of stars during their regular lives. But many heavy elements are produced only in the dying stages of a star, such as an explosive supernova (SN) or the winds from an Asymptotic Giant Branch (AGB) star. The authors of today’s paper are engaged in Galactic Archaeology: the process of uncovering the star formation history of a galaxy (here, the Milky Way) using stars which are left over from when the Milky Way was first forming. They use measurements of heavy element abundances to study the history of how and when the Milky Way became enriched in heavy elements. Specifically, they are concerned with elements formed through slow and fast neutron capture. Typical nuclear fusion (colliding two nuclei together to produce a larger one) is only able to produce elements up to iron. Elements more massive than iron are created through a mechanism called neutron capture, where a nucleus absorbs a number of stray neutrons, some of which beta-decay into protons. You’ve now created a heavier element! But what elements can be produced this way depends on how rapidly the neutrons are added onto the nucleus. The “s-process” (or slow neutron capture) occurs when a nucleus only absorbs one neutron at a time. The s-process takes place in AGBs, low-mass stars which are in the process of dying and ejecting their outer envelopes. Since low-mass stars have very long lifetimes, AGBs should only begin to enrich their surroundings around a billion years after they are first formed. The “r-process” (rapid neutron capture) involves a nucleus capturing many neutrons in a short time, compared to how quickly the neutrons decay into protons. There are several places where the r-process may occur, with one example being a Type II supernova (SNII) of a very massive star. Massive stars die quickly, so SNII should enrich their surroundings very soon after the first stars are formed. The s- and r- processes are thought to produce many of the same heavy elements, like samarium (Sm) and zirconium (Zr). But, to a good approximation, Europium (Eu) is produced almost entirely by the r-process, while Barium (Ba) is primarily produced by the s-process. So by studying the relative amounts of Eu and Ba in old Milky Way stars, the authors hope to determine when SNII (r-process) or AGBs (s-process) were most responsible for enriching the Milky Way. Fig. 1 – The high-resolution spectrum around a Zr absorption line. The black points are the data, and the blue lines represent model spectra for different abundances of Zr. The best-fit abundance is shown with a red line. The bottom panel shows how much each model deviates from the data, and the insert shows the goodness-of-fit measure for different abundances of Zirconium. Fig. 1 from Battistini and Bensby 2015. The authors used high-resolution spectroscopy of 593 stars, which includes measured absorption lines for a large number of heavy elements. The depth of each absorption line can be used to measure how much of each element is in the star’s atmosphere. Figure 1 shows an example line for Zirconium (Zr). The data (in black) can be fit by a variety of model spectra (blue lines) which have different abundances of Zr. By finding the best fit line (red), they infer the abundance of Zr. Aside on notation: Abundances are commonly measured relative to other elements (like Hydrogen), and compared to the Sun. Since there is a large range of abundances in different stars, astronomers report abundances using logarithms. The authors use the following notation: [X] = log10(X) – log10(X_sun). In other words, [X] is the logarithm of the value X relative to the Sun. A star with [Fe/H] = -1 has 1/10th the iron abundance that the Sun has, and one with [Fe/H] = -2 has 1/100th that of the Sun. What Produced the Heavy Elements? 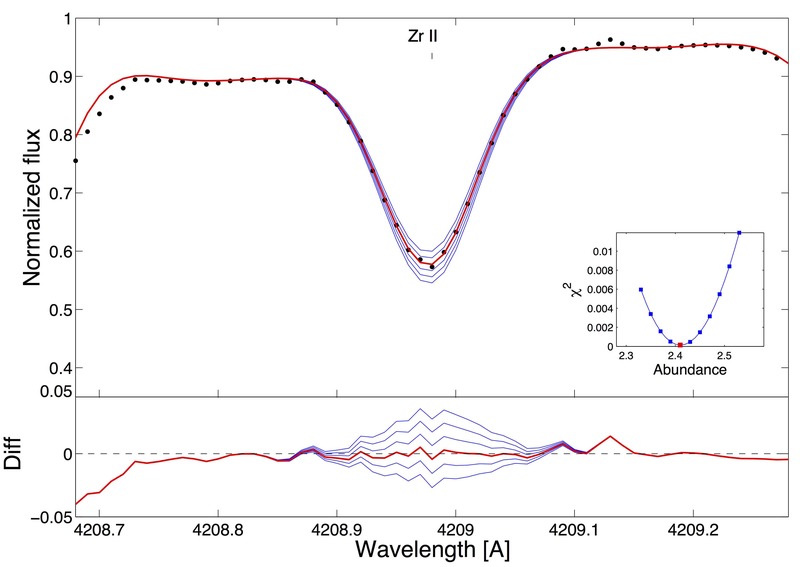 The authors use the ratio [Eu/Ba] as a proxy for the relative contribution of r-process and s-process enrichment to a star’s chemistry. They compare this ratio to the iron abundance: [Fe/H]. Since iron is produced in all enrichment processes, [Fe/H] acts like an enrichment stopwatch: stars with low [Fe/H] were created early, before the Milky Way had been highly enriched. Those with higher [Fe/H] were formed later, when the Milky Way was already enriched. Fig. 2 – The ratio of Eu to Ba measures the relative contribution of the r- and s- processes. The x-axis [Fe/H] is a rough indicator of when a star formed: more metal poor (low [Fe/H]) stars formed earlier. The negative slope indicates that the r-process (which produces Eu) was active early on, while the s-process (Ba) enriched the Milky Way at later times. Fig. 3 from Battistini and Bensby 2015. Figure 2 shows the [Eu/Ba] ratio as a function of the metallicity ([Fe/H]) of each star. The “pure r-process” line shows where the [Eu/Ba] ratio would be if there was no s-process enrichment. 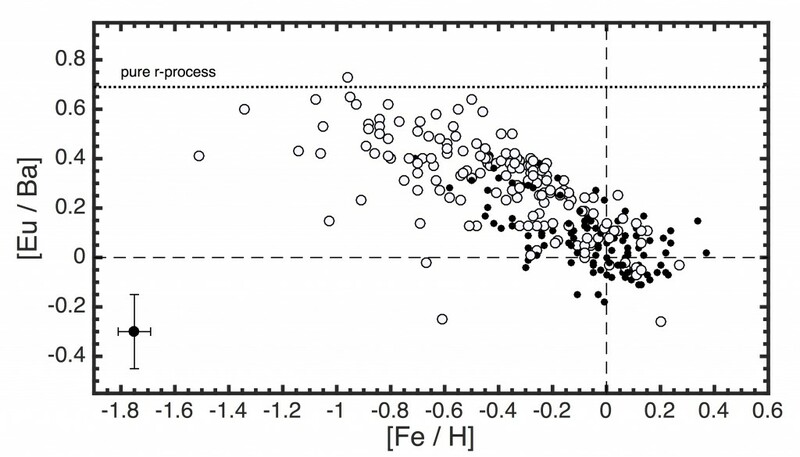 The figure clearly shows that stars which formed earlier (with lower [Fe/H]) were primarily enriched by the r-process. They have higher [Eu/Ba] ratios, close to what would be predicted if the r-process were all that contributed. Younger stars (those with higher iron abundances) have lower values of [Eu/Ba], suggesting that the s-process became more significant later on. The authors conclude that the r-process was responsible for enriching the Milky Way at early times, while the s-process kicked in later. This agrees with the expected picture of where the r- and s- processes are active. Type II supernovae (a possible source of r-process elements like Eu) will begin to enrich the Milky Way shortly after the first generations of stars are born. AGBs will only start to produce s-process elements after hundreds of millions of years, when the first generations of low-mass stars die off. The true ages of these stars are difficult to measure with spectroscopy or photometry alone. If we had more precise ages for these stars, we could pinpoint the actual time when the r- and s- processes started enriching the Milky Way. By measuring more accurate ages of these stars with gyrochronolgy, future Galactic Archaeologists will soon be able to say much more about the history of our Milky Way, when the first stars were born, and when they first started enriching the galaxy with the ingredients of life.